Welcome to our Bosch IoT Suite for Software Updates. With this tutorial (approx. 20 minutes), you will learn how to subscribe to the service package and perform a software update. This involves setting up the Bosch IoT Gateway Software on your machine so that it can communicate with Bosch IoT Remote Manager and Bosch IoT Rollouts in the back-end. Finally, the tutorial shows you how to create and deploy a software update to this device using the Bosch IoT Suite for Software Updates. 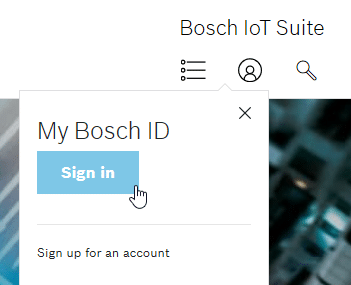 Use the Bosch IoT Suite portal as an entry point. Click My Account and Sign in with your Bosch ID. If you don’t have an account yet, register a new one (Sign up for an account). After logging in, you will be redirected to the Service Subscription page of the Bosch IoT Suite. Select Bosch IoT Suite for Software Updates. Enter your Instance Name (must be unique). On the Service Subscription page, the Status of the service will be displayed as Provisioning while the service subscription mechanism checks the validity, e.g., whether the instance name is unique. If the Status does not change to Active within a few seconds, click the Refresh button. Tip: All these credentials are also useful when you need to address one of these services by their own API..
First, set up the Bosch IoT Gateway Software as a device on your local machine and register it. 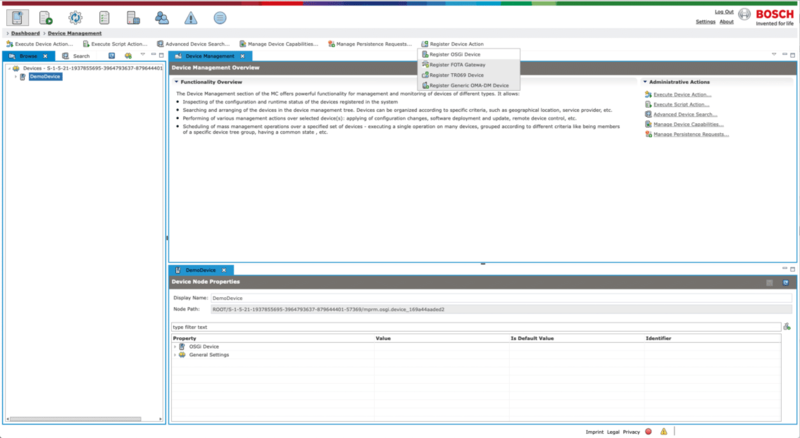 The required steps for registration and connection of an OSGI device can be found in the Bosch IoT Remote Manager documentation. The relevant sections are Register your OSGi Device, Download a Demo IoT Runtime, and finally, Install the Connectivity Pack (if you are behind a proxy, see also section Connect OSGi Device Through a Proxy Server). To verify your setup, go to the Management UI of Bosch IoT Rollouts. The link is found in the Bosch IoT Suite portal under Service Subscriptions – Go to Dashboard. In the Deployment View you should see a device. The name of the device should be similar to mprm.osgi.device::<id>. Once the device has been registered, you can create the update you want to install on it in Bosch IoT Rollouts. Start creating an update by switching to the Upload view in the navigation bar and create your first Software Module of type Zip File by clicking on the plus icon. In a second step, you can upload a zip file by dropping it on the drop zone in the lower right corner. Now you need to define a Distribution Set to package your Software Module. To do this, go to the Distributions view in the navigation bar, click on the plus icon, and select the Zip File(s) type. 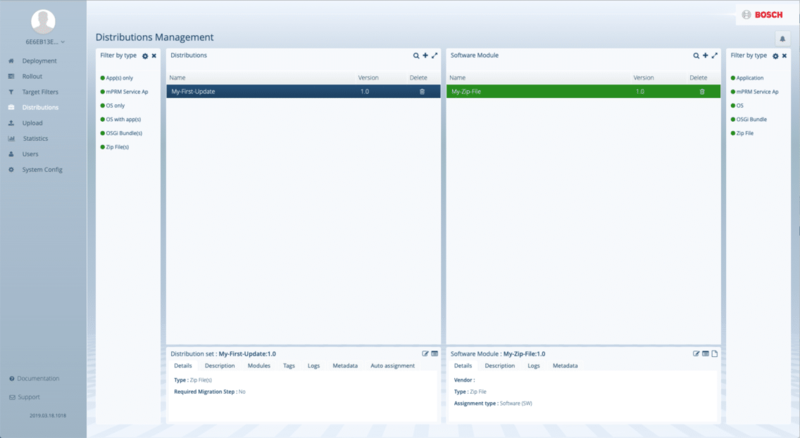 Finally, assign your Software Module to your Distribution Set by dragging and dropping the former onto the latter. You can assign the Distribution Set to your device by going to the Deployment view and dragging and dropping your Distribution Set onto your device. In the opening dialog, select Forced and click Ok. The update is now deployed to your Bosch IoT Gateway Software device on your local machine. Once the update is installed, you should be able to see that the Bosch IoT Gateway has downloaded and unzipped the zip file. By default, the content of the zip file is unzipped to a subfolder under your “tmp” folder (/tmp on Unix machines and %tmp% on Windows machines). The name of the folder should be similar to zipfilename_timestamp. Congratulations, you have successfully installed your first software update using the Bosch IoT Suite for Software Updates!